The garden has been a universal theme in art since the ancient Egyptians. It has represented heaven, the status of the aristocrat, the ideal world, and a symbol of peace and contentment. I like the idea of sharing those concepts with an image of a park that is right in our park system; that we can all experience. Painting a garden allows me to experiment with brushstrokes and to paint with bold colors and more abstract images. In 2004 I discovered Sibley Park. I had lived here in Mankato for 24 years before I really saw the flower garden. Once I experienced the peak flowers of late July, I have been back painting there every year. The garden has become an important theme for me and one that I hope others can enjoy. Bill Bukowski has been a longtime Art professor at Bethany Lutheran College in Mankato. He grew up in Wisconsin and finished his MFA in Painting from the University of Wisconsin in Madison. His undergraduate degree is from University of Minnesota-Mankato. Bukowski has been painting from life in a realistic manner since the early ’70s. 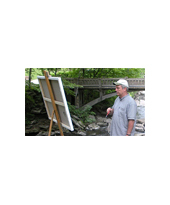 His work can be found in many public and private collections in the Midwest. Recently, he has been doing commissioned work for the Children’s Hospitals of Minneapolis and St. Paul and has over 20 paintings in the two hospitals. Since 2004, Bukowski has been doing paintings of Sibley Park in Mankato. One of his paintings of Sibley Park is featured in a mural size painting at Pathstone Living near the park. Bukowski has also done altarpiece paintings for several churches including Bethany’s Trinity Chapel, Reformation Lutheran in Portland, Oregon and Christ’s Chapel at Gustavus Adolphus College in St. Peter. Along with creating art, Bukowski enjoys travel and the movies. He is married and has three grown children.